The output of the Paramount Record Company in the late 1920's and early 1930's is among the most frustrating in the history of recorded sound. 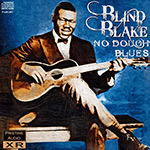 On the one hand, they managed to assemble what has come to be regarded as one of the greatest 'stables' of blues musicians ever to record under one label, and of those, Blind Blake is most certainly in the very top rank. On the other hand, their production values and methods were abysmal. Disc quality was so poor that even when new and unplayed their products were so shoddy and inferior that they lost distribution deals and some shops refused to stock them. Rather than invest in metal masters strong enough to withstand the requirements of pressing a hit record, they used cheap, soft metal parts which quickly deteriorated. If a hit was on the cards they merely recalled the musician and got them to re-record the song and make a new, poor quality master - hence the existence of several versions of a number of Blind Blake's output in varying degrees of sound quality, often ranging from poor to abysmal. In putting together and remastering this collection I've tried to balance a number of requirements: firstly to put together a representative sample of Blake's entire recorded career between 1926 and 1936, secondly to cover a range of styles, and thirdly to try and find the best sounding surviving recordings from which to work. The latter means, inevitably, that there is some considerable overlap with other one-disc sets. So do we really need another Blind Blake collection? Well it is my belief that, thanks to recent advances in sound restoration and remastering, it is most certainly worth revisiting these recordings once again. I've aimed not just to reduce background noise, but also to re-equalise to varying degrees a majority of the tracks in order to compensate for the sonic inadequacies of the Paramount originals. In most cases this has resulted in a much fuller and well-rounded sound, as well as a smoother and more convincing top end. Alas all too often the high treble simply disappears into the surface hiss, and one can debate for ever the precise balance of top end hiss suitable allowable in order to discern the music buried within it - for each track a careful judgment has been necessary, based on the widely varying quality of the original material.